It was my first time to step inside the fairly new massive property of Gloria Maris, albeit I've seen it during the rare times I was in Greenhills. From the outside, its size already gives you an idea of how big the whole place is, but until you find yourself in the middle of the dining hall, your eyes crawling up the grand spiral staircase, and finally staring up at the high ceiling, you wouldn't realize just how big---and impressive---is big. How big is big? 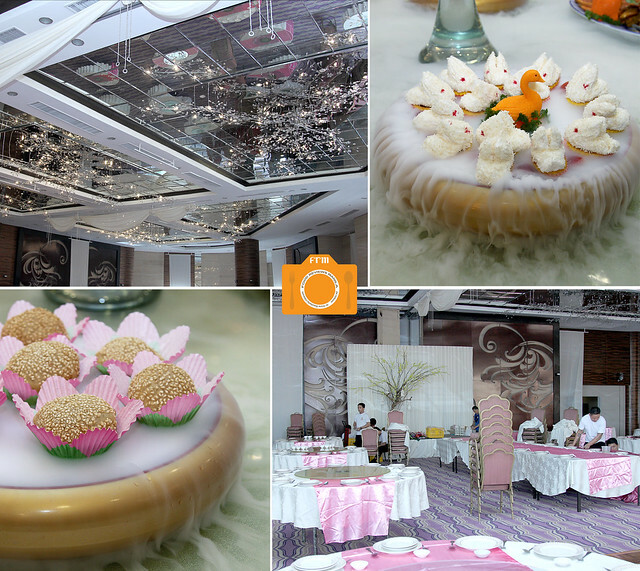 It's actually about 7,500 square meters of dining halls on the ground floor, private VIP function rooms on the mezzanine level, and a banquet hall on the second floor. Just to give you an idea -- it has its own set of elevators! 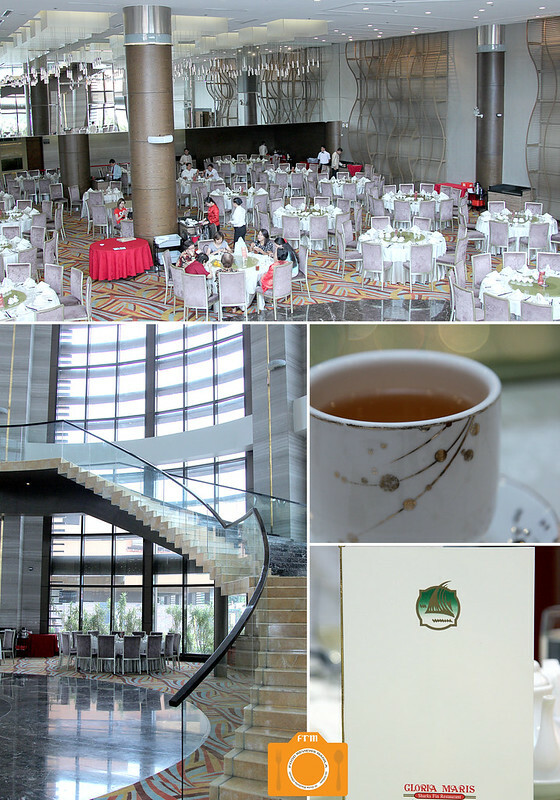 As I took the elevator, and sauntered past hallway after hallway of function rooms, I felt like I was in a Korean drama -- the only place where I've seen restaurants this huge. 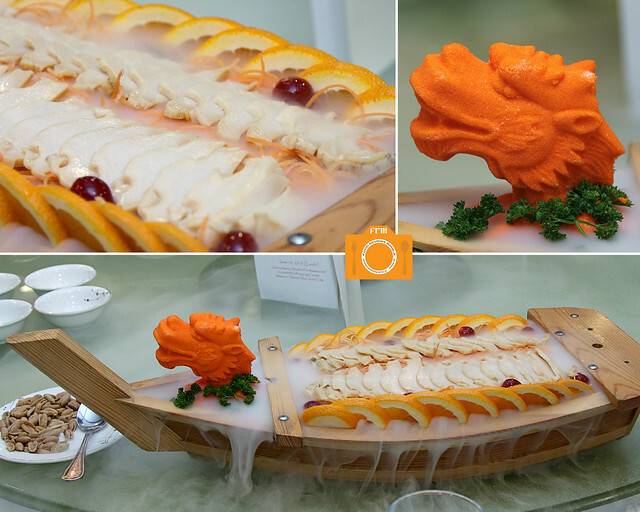 I finally found our VIP room, and when everybody had arrived, we started our feast with this wooden dragon boat of Abalone Sashimi. The entrance was dramatic as smoke (dry ice, naturally) poured out from every side. The fresh abalone in itself was expectedly bland, but dip it into the accompanying creamy wasabi mayo and it transforms into one stellar bite. The heat wasn't as harsh as a regular wasabi's, and you could also opt to dip it into the soy sauce on the side. 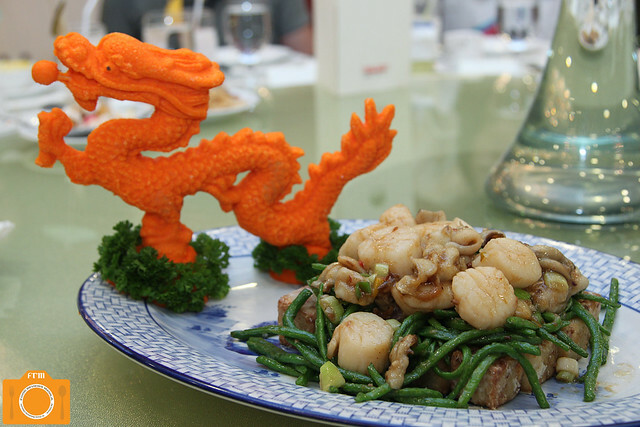 It was pretty unusual to use strawberry sauce in a Chinese dish, orange would be a more common one. And yet, this one worked perfectly well with the succulent prawns atop a bed of crispy rice. The fresh strawberry bits even lent a bit of tartness that was well received. 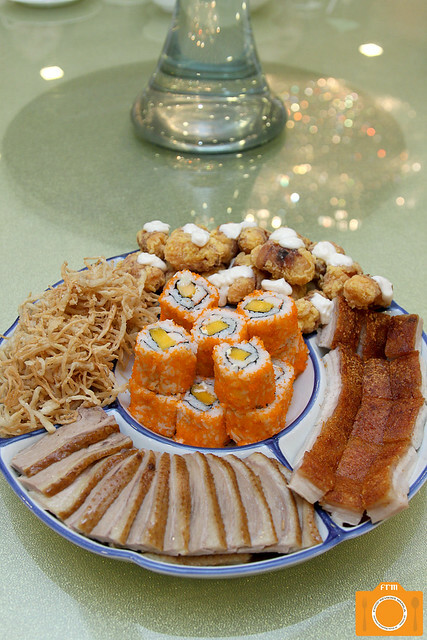 Veering from the usual platter of cold cuts, the Chiu Chow Cold Cuts consists of crisp enoki mushrooms, bacon rolls, crisp pork belly, roast duck (? ), and california maki. Even though I love the century egg/jellyfish combo, this one was quite a treat, too. I enjoyed every single element, and kept switching back and forth to each piece, unable to have just one favorite. The Yin Yang design was a nice touch. Much nicer was the Pumpkin portion of the soup. 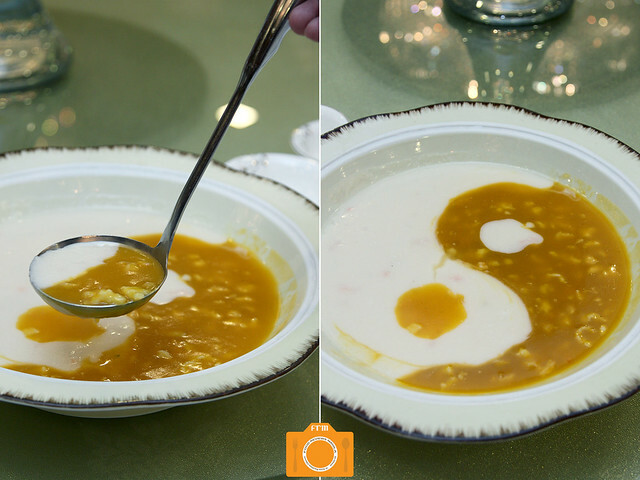 Creamy and hearty, the pumpkin taste was so distinct, yet at times it also felt like eating egg yolks. The almond flavor, on the other hand, was lost on me. No matter, the whole thing was simply so good, I kept mopping my bowl down to the last drop. 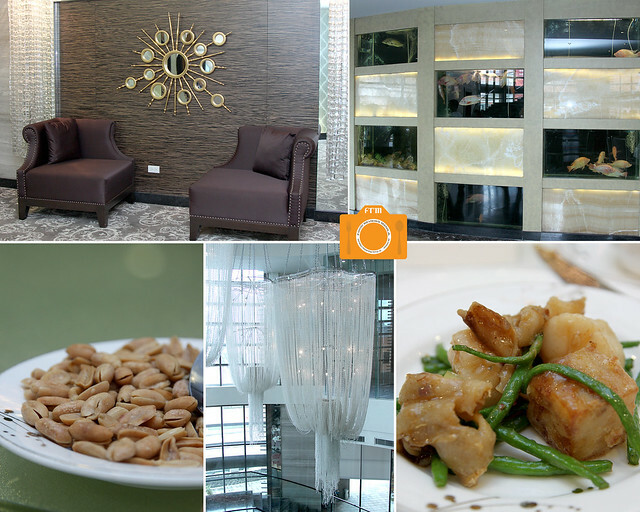 Aside from the main dining hall, they also have a dim sum area and a hot pot area. Their dishes are definitely a feast for the eyes as well. The fresh, succulent scallops rest on a bed of french beans and raddish. 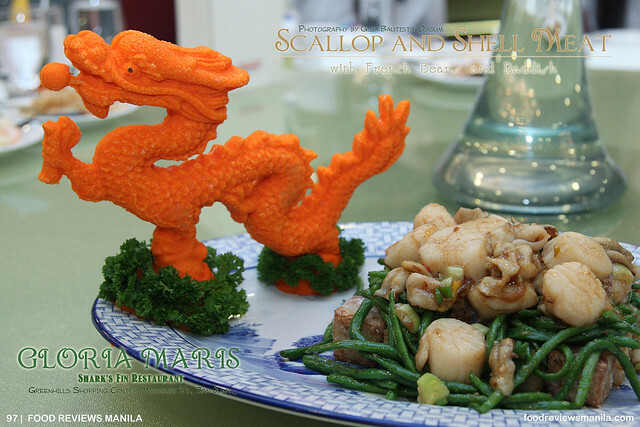 Meanwhile, a small orange dragon sculpture (as we will see in more of their plates) provides a nice, dramatic backdrop. 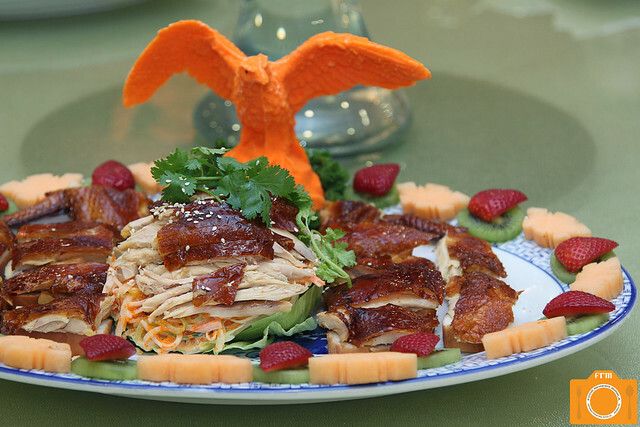 Another favorite was the Peking Chicken salad, which I first thought was Peking Duck. 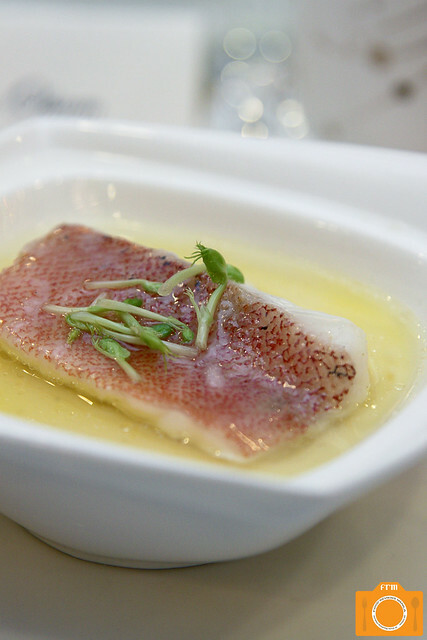 It had the same delicate crisp skin with a very thin layer of fat, and a layer of white chicken meat atop a crunchy version of mantou (steamed bun). Another pile of shredded Peking Chicken concealed a heap of crabstick salad, which I loved. The whole dish's parameter was even decorated with artfully sliced strawberries, melons and kiwis. Pair this with champagne, and fall in love with every forkful. I'm not a fish person, the only fish I eat can be counted on one hand. Let's see, there's salmon sashimi, tuna sashimi, cream dory, fried tilapia, and boneless bangus. So it doesn't come as a surprise that I lacked such appreciation for this dish. The flavor was light and clean, and almost everyone else loved it, though. 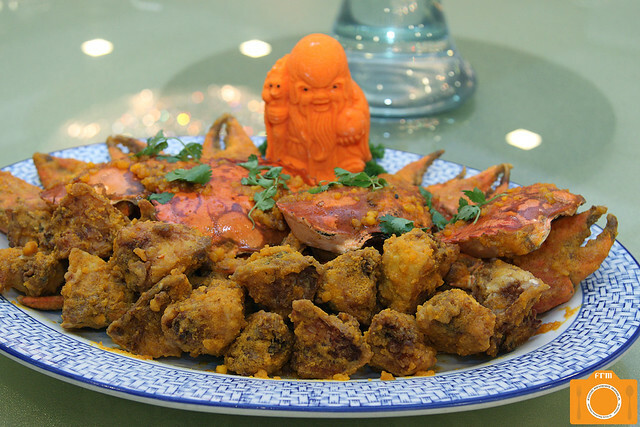 I usually steer away from crabs since they're pretty hard to tinker with. I like the soft-shelled ones just so I can directly eat it without any hassle. Still, I managed to taste this fried one with salted egg, and flavor-wise, it was indeed good. The white crabmeat was tasty, made more so by the salted egg flavor that clings to it. The banquet hall with such beautiful lights overhead. Desserts were also served in a surreal smoky setting. 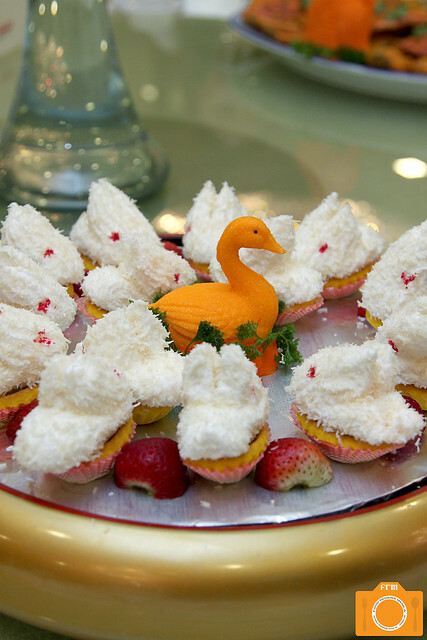 I don't have a particular proclivity for grated coconut on pastries, and would have preferred to have the bunny slipper-shaped marshmallows plain. Underneath was a tart that cocooned a sweet filling reminiscent of monggo-flavored hopia. I had to laugh as soon as I bit into this buchi on steroids. 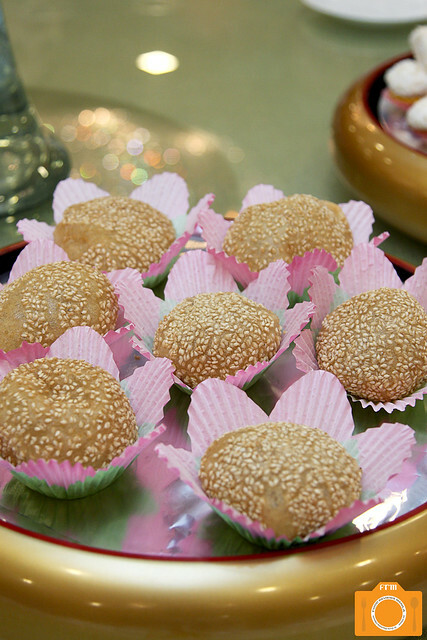 When I was a kid, I hated buchi, or rather, I hated the sticky stuff inside it. This would have made me happy, as it had nothing but air inside. I love Gloria Maris' taho, and missed it for a while now. Imagine our delight when they served us that as well. 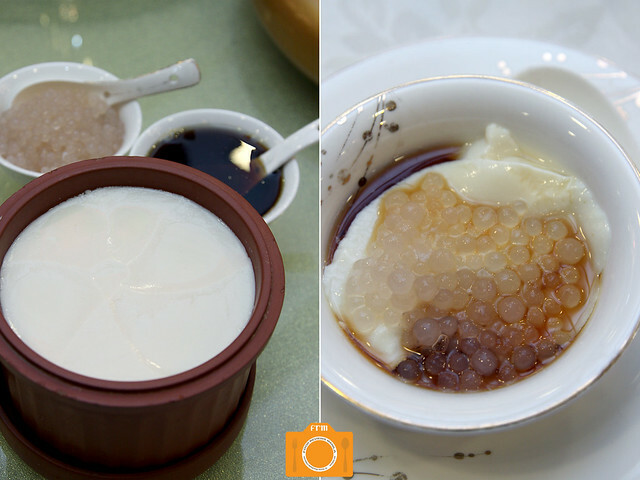 Silky tofu, sweet syrup and sago pearls stared back at me before I mixed them all up and had my fill. A deliciously sweet concoction slowly lined my throat as I escorted spoonful after spoonful into my mouth. 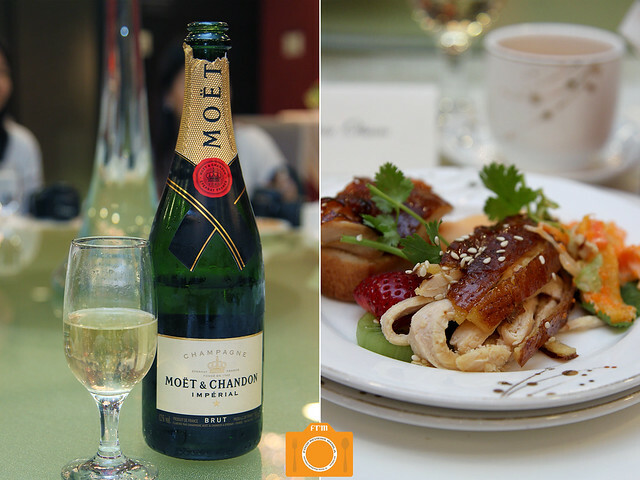 Loved the Peking Chicken Salad chased by champagne. 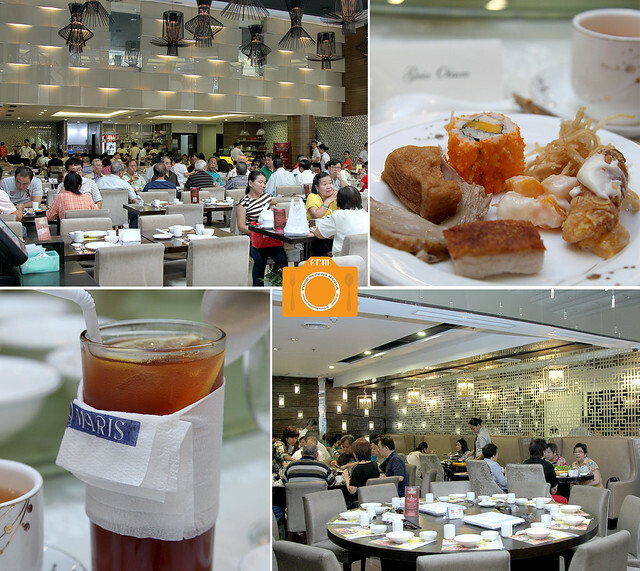 It's nice to know Gloria Maris offers far more lovely dishes than the usual Chinese fare. I'll be going back for the Abalone Sashimi, Prawns with Strawberry Sauce, Chiu Chow Cold Cuts, Pumpkin Soup, Peking Chicken Salad and of course, Taho. 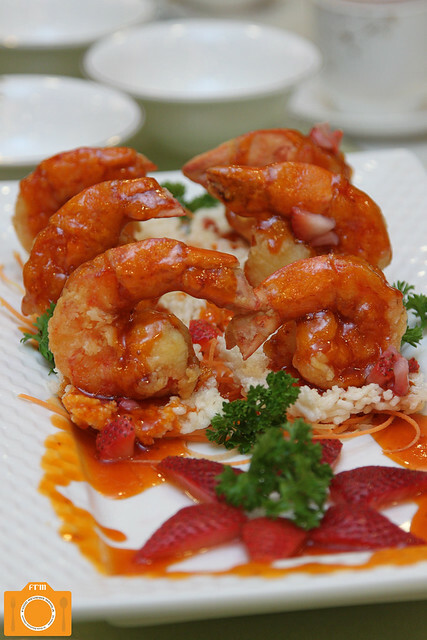 I think I'll even order my all-time Gloria Maris favorite again -- the Hot Prawn Salad. Oh, and by the way, in celebration of this branch's 1st Anniversary, Gloria Maris offers 30% off your food bill for a minimum spend of Php 1,000 (cash or credit card payments), with a maximum discount of Php 8,000 per table. This offer is available from Mondays to Fridays until July 31, 2013, except during holidays.